Congratulations, you have a baby on the way! It’s an exciting time in your life -- once you’ve gotten over the panic of being responsible for a little life, that is. There’s so much to look forward to from sleepless nights and late night feedings to little league games and prom dates. There’s a long way to go before that, however, and you’ve got to make sure you’re ready for the little one’s arrival. You have your crib, stroller, diapers, bottles. You even have a brand new child seat because you don’t want to take chances on safety, right? But what about your vehicle? Is it time to get a set of wheels more family-oriented? If it’s time to buy a new family vehicle, you need to wade through all the technical jargon and fancy doodads and find the features that are truly important for your future parenting success. If you’ve never travelled in a vehicle with a child seat directly behind you, you may not be acutely aware of the need for plentiful rear seat space. Kids are small and don’t need much space, right? Wrong! By the age of about two, their legs are long enough to cause whiplash when they kick the back of your seat. How it’s physically possible is unknown, but it’s true. When you’re car shopping, look for a vehicle with enough space to accommodate an adult in the backseat. Not only will it prevent those unforeseen kicks in your back, but it will provide you with ample space to get your little one properly seated and buckled in without requiring contortionist pilates moves. 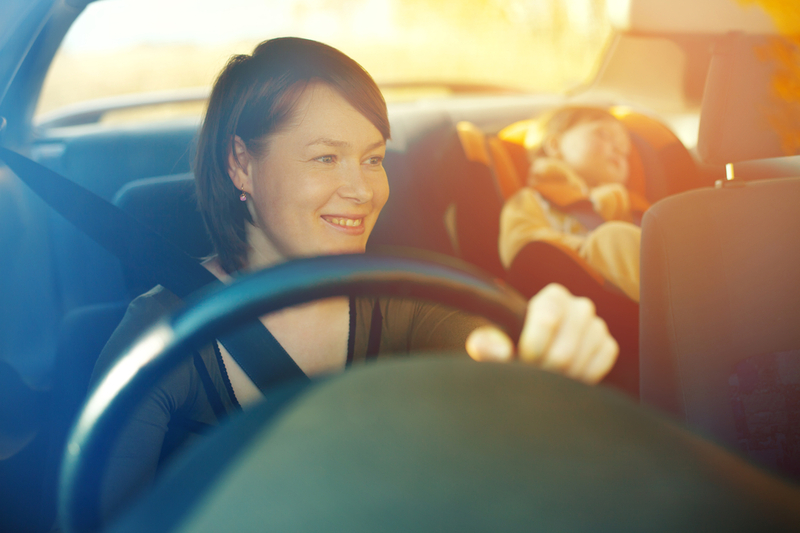 As your child ages, your vehicle will still be large enough to use. Have you ever gone on a day trip with a friend or family member that had a child in tow? Whether you head to the beach for the day, to the theater for a movie, or just down the street to drop their toddler off at daycare, it requires several trips from the house to the car just to load up all the supplies. A playpen, diaper bag, snack bag, change of clothes, walker, stroller, and more will often get packed into the trunk or hatch area of the car. Now that you’ve got a child of your own on the way, you can look forward to packing your car the same way. There is never -- I repeat, NEVER -- too much cargo space if you’re toting your child around. A full-size sedan with a large trunk is excellent, though the minivan takes top prize for cargo capacity. Its wide-opening liftgate and tall storage area have ample space for virtually everything you need for a day or week away with the tot. It’s simply unrealistic for every parent to buy a vehicle with easily-wiped leather seating, not to mention leather is more delicate than it appears. So, to do your best at keeping your vehicle tidy and orderly, keep the floor carpets clean. You can buy inexpensive floor mats at the department store which are better than nothing, but when a bottle of milk spills on the floor in the backseat, they might not catch every drop of that dreadful liquid that spoils in an instant. Prevent the permanent sour smell in your interior with high-quality, precision fit floor liners from Husky Liner or WeatherTech. With deep reservoirs that will capture spills, not to mention water, snow, and mud in later years, your floor mats will help you maintain your vehicle’s value for years to come. As mentioned before, there’s never too much cargo space in your vehicle when you’ve got a child in tow. That’s where various seating configurations are wildly beneficial. If you’ve ever had the pleasure of using Stow ‘n’ Go seats, you’ll understand this fully. Maybe you need extra space because you’re hauling the kiddie pool along to the in-laws, or you’ve got boxes of outgrown toys to drop off at the thrift store. Making a seat disappear into the floor, completely out of sight and out of the way, will make you sing sweet hallelujahs. Even having seats that slide forward, backrests that tilt or fold flat, and bench seats that can be removed altogether are a blessing in times of cargo need. Look for a vehicle that has plenty of seating configurations to make your parenting life easier. LATCH is the standard for child seat anchors in all modern vehicles, keeping Junior safe while in their properly-installed child seat. While LATCH (which stands for Lower Anchors and Tethers for Children) is standard equipment, the locations aren’t all standard. Many vehicles have LATCH points only on the outboard seats, which can be a nuisance depending on where you are sitting in the front. Look for a vehicle that has LATCH tether points in the center seat spot in the backseat. That way, both the driver and front passenger are able to easily turn and assist the mini passenger in the backseat (driver, only when it is safe to do so!!). Parents-to-be, your child is eventually going to grow from a little nugget of joy to a finicky toddler and beyond. For quiet, enjoyable drives, you’re going to absolutely NEED a rear seat entertainment system. Some minivans have a massive 16-inch ultra-widescreen display while some SUVs have roof-mounted or headrest-mounted DVD players. Trust me -- it’s an investment in your mental health. There’s only so much “Wheels on the Bus” to go round and round. You may not think it’s important right now, but a backup camera can save you many, many heartaches and tears. Backup cameras are much more common than they used to be and it’s a great option to have. Whether you’re avoiding running over tricycles and toys left on the driveway or children darting behind you as you’re reversing, backup cameras help you avoid accidents, injuries, and property damage. Whatever family-friendly vehicle you choose, it’s important to keep it in top operating condition for your family’s safety. Whether you’re headed out on a family roadtrip for a couple weeks or hauling a carload of kids to a birthday party, have your vehicle routinely inspected and maintained by professional mechanics, such as those from YourMechanic. Q: How do you attach a child seat with a tether? Q: What should you do if a child requires close attention while riding?